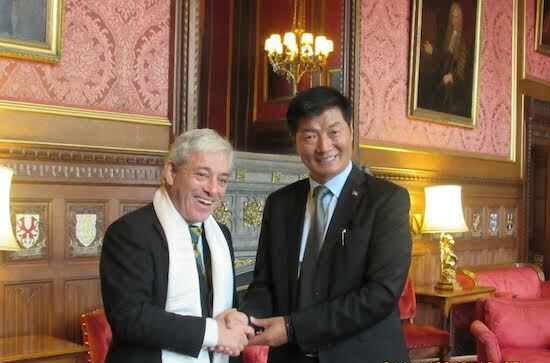 (TibetanReview.net, Nov03, 2016) – The head of the exile Tibetan administration at Dharmshala, India, Sikyong Lobsang Sangay, on Oct 31 met with the Speaker of the House of Commons of the British Parliament. He also addressed a meeting of the All-Party Parliamentary Group for Tibet (APPGT) in the UK Parliament. The Speaker, Rt. Hon. John Bercow, was stated to have recalled the time when he hosted the Dalai Lama in the Parliament, mentioning what a great honour and privilege that was. He has expressed strong support for the non-violent and just cause of Tibet. Earlier in the day, 10 members of parliament belonging to three political parties attended a meeting of the APPGT which was chaired by Tim Loughton and addressed by the Sikyong. Later in the afternoon he addressed a gathering of the Henry Jackson Society, a think-tank working to advance democracy and human rights. It was chaired by Fabian Hamilton, MP and a former Chair of APPGT. The Sikyong also appeared on the BBC World News television interview with Halda Yakim.